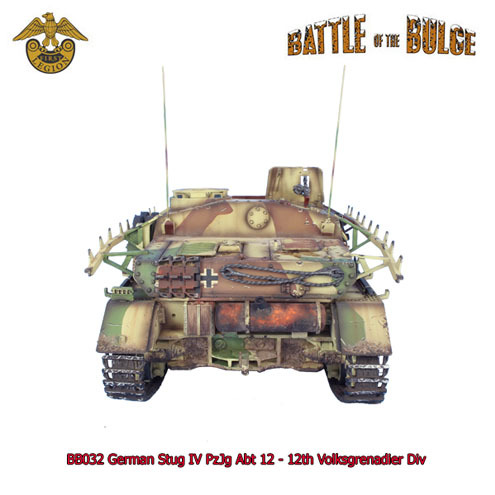 First Legion is extremely pleased to present the next vehicle in our “Battle of the Bulge” series, BB032 German Stug IV PzJg Abt 12 - 12th Volksgrenadier Division. The 12th Volksgrenadier Division, reconstituted from the previously destroyed 12th Infantry Division, saw action initially in the Ardennes as the Battle of the Hurtgen Forest. This action was particularly important as the area was to serve as the launching point for "Wacht am Rhein", the German counterattack which ended the Battle of Hurtgen. It was attached to the 1st SS Panzer Corps, 6th Army for the Ardennes Offensive. 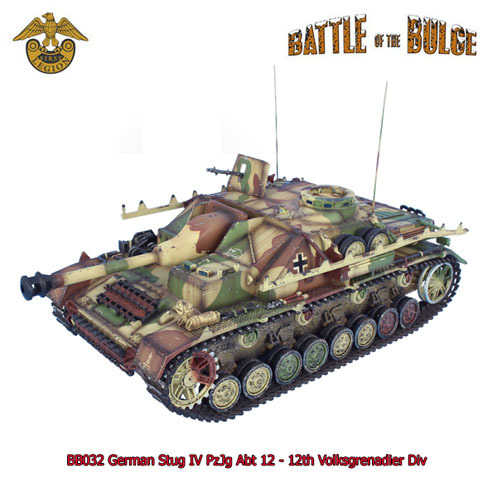 When the offensive failed, 6th Panzer Army was transferred to the Eastern Front and the 12th Volksgrenadier Division was left behind to face the advancing Americans. 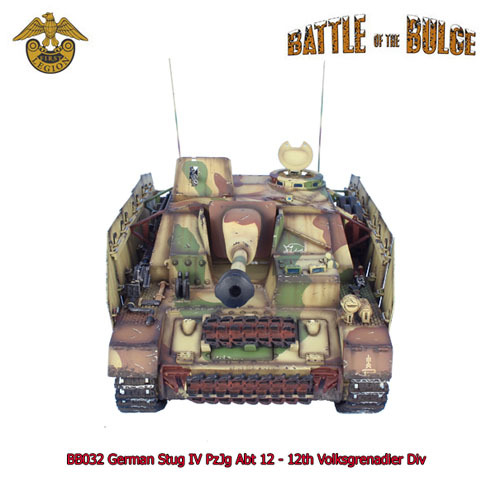 The Sturmgeschütz IV (StuG IV) was an assault gun based on the chassis of the Panzer IV. 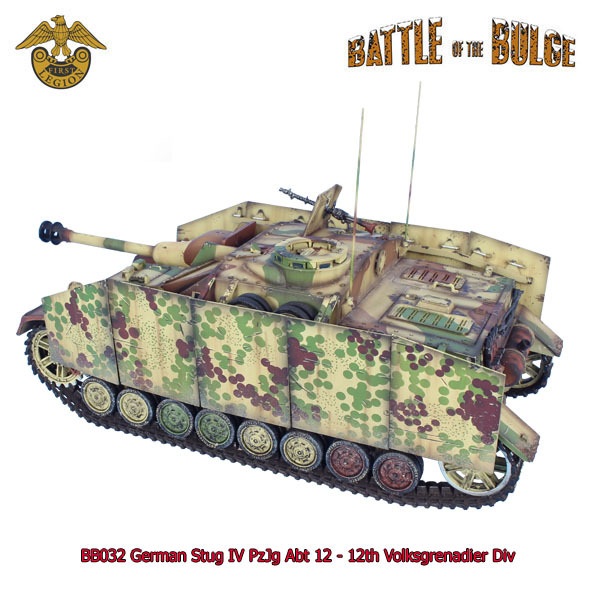 It performed admirably in it's role as a tank killer and was typically attached to infantry divisions. It had the same main armament as the German Panzer IV, the 7.5 cm StuK 40 L/48 and a crew of four men. 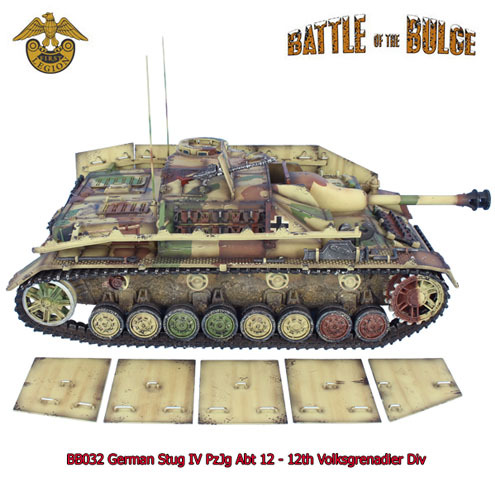 Out variant features opening and closing hatches, raising and lowering gun barrel, and removable side skirts such that you can configure the model as you prefer, with all skirts, no skirts, or a mix them as desired. 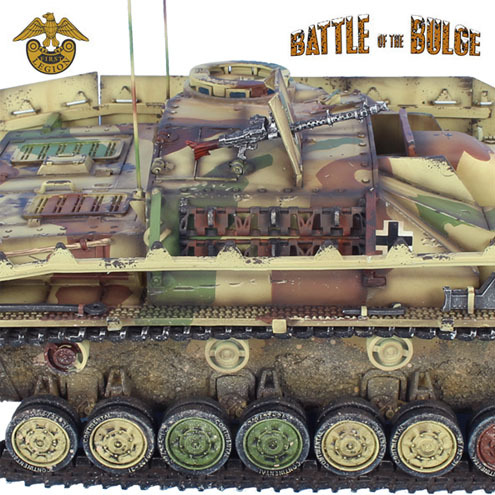 It truly is a stunning model with extremely detailed weathering and painting which has been produced in very limited quantities. Close Up Shot of the Wonderful Detailing!